I love the look of welcome at the front door of Little Frog far east on 86th Street. Every neighborhood should have a small French bistro. Did I only just realize that? For too long perhaps, I’ve been distracted by ethnic adventure or been caught up in the magnetism of creative American kitchens. 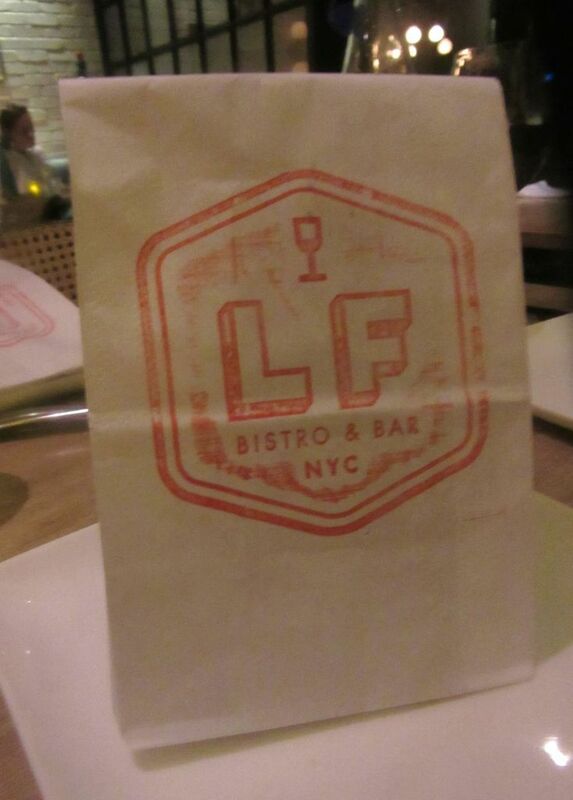 The old- fashioned need for an old-fashioned bistro seizes me this week at Little Frog, as Upper East Side pals and I sit sharing the house’s excellent steak tartare while the place fills up. Clearly, we are surrounded by regulars from the neighborhood. I see them reflected in the tilted mirrors. A paper bag or two hit the table delivering the house’s warm special bread. 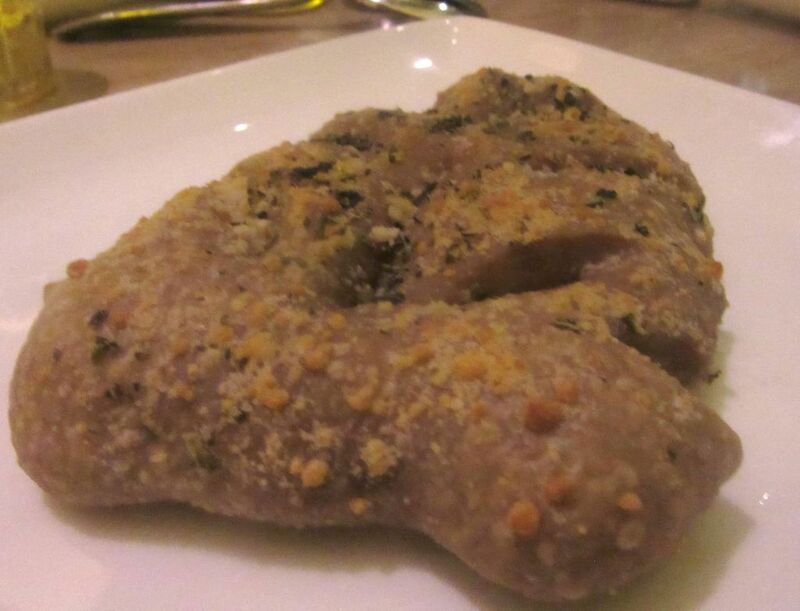 Fougasse is a flatbread associated with Provence often sculpted or slashed to look like an ear of wheat. The waiters in their blue butcher aprons act as if they know us too, sending bussers to drop off warm house-baked fougasse twists in papers bags, with a saucer of olive oil and foil-wrapped butter squares, while they disappear to fetch drinks. Foil-wrapped butter, we tsk tsk. The waiter makes an effort of arrange plates on the small wooden table, so we can share. 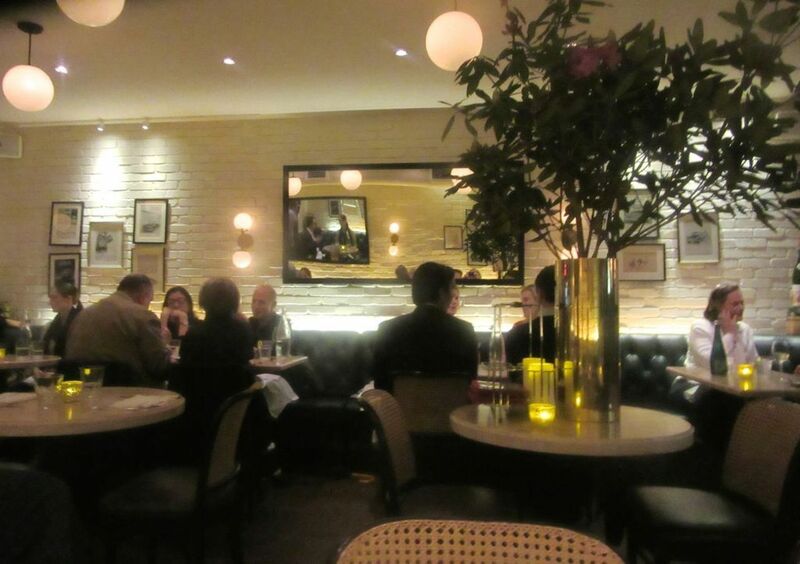 The crowd reflected in the mirrors on opposite walls looks very Upper East Side to me. The crew fuss in relays, attentive, delivering starters with serving spoons and square plates so we can help ourselves. One of them politely pours two splashes from a pair of open bottles, so I can choose a red. Côtes de Rhone or Grave. I pick the $13 Chateau Boylan. Dishes quickly fill the bare wooden table. Yes, a tablecloth would be nice on these tacky wood tabletops, a bit too high for the intense green tufted leatherette banquettes. That’s just minor piffle. 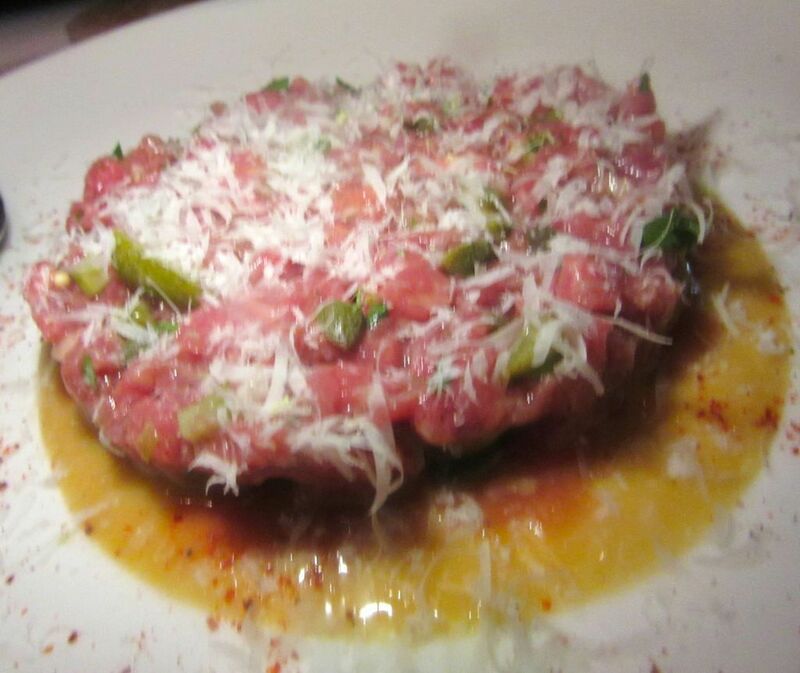 The steak tartare is full of flavor and comes with cornichons and hand cut French fries. 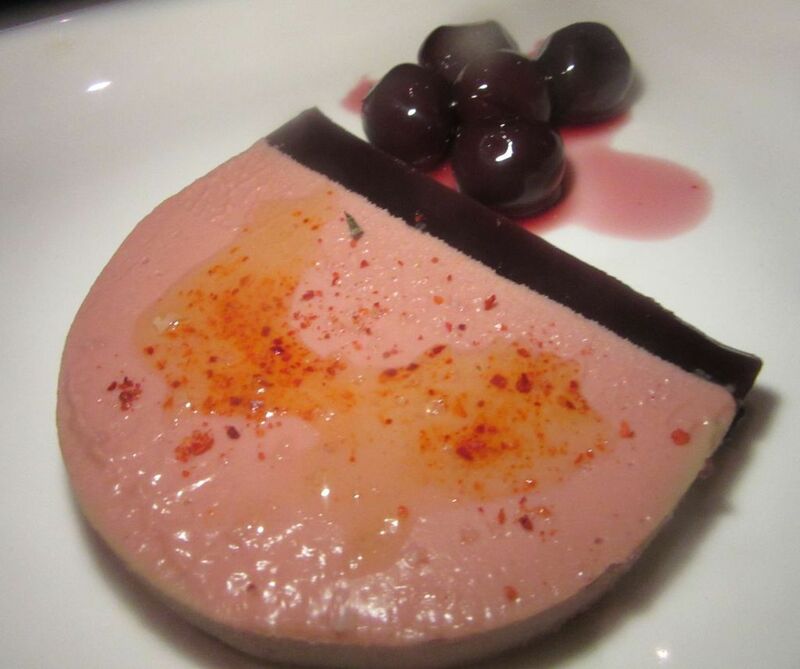 An excellent special one evening is the duck liver parfait with Griotte cherries. There’s the exceptional tartare of course, but the special duck liver foie gras parfait with brandied Griotte cherries is good too. Alas, the scrawny frog’s legs in a nest of tatsoi and parsley taste as if they were cooked weeks ago and lost on the stove until now. 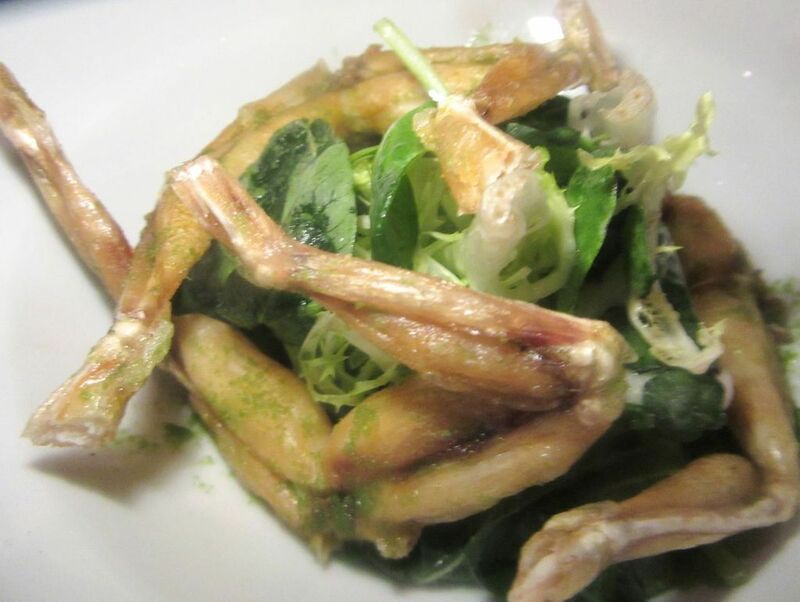 The fried frog’s legs are hopelessly scrawny, not just meatless but dry as if precooked and cooked again. Our host, François Latapie, sends a gift of Comté cheese fritters to amuse us while we wait for the whole duck. The menu is very meaty, I notice, with a section of Butcher’s Choices. Since we’ve ordered the house’s special -- the whole lacquered canard “aux E´pices d’Orient” for two – it will take an extra while. 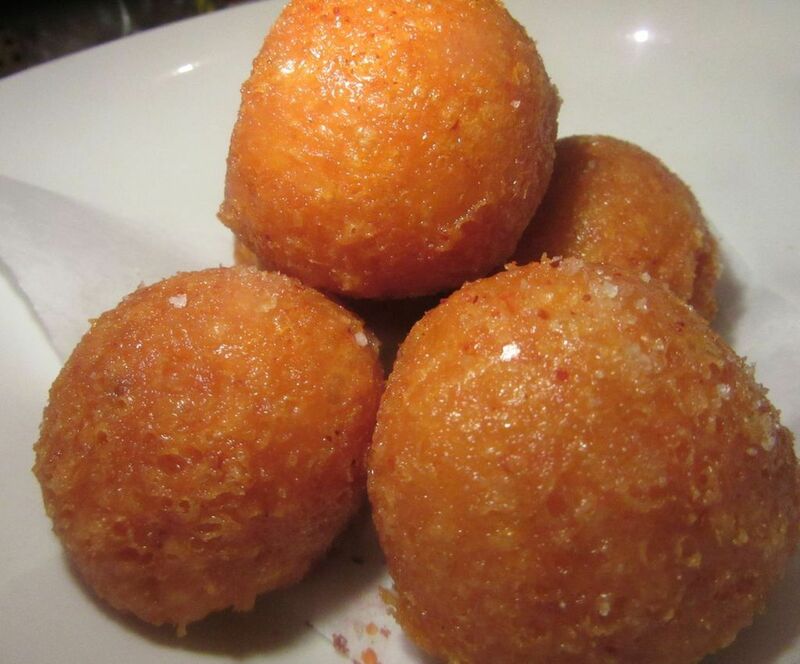 Our host, François Latapie, a familiar face from French restaurants, sends delicious Comté cheese fritters and a dish of blistered shishitos to fill the wait. 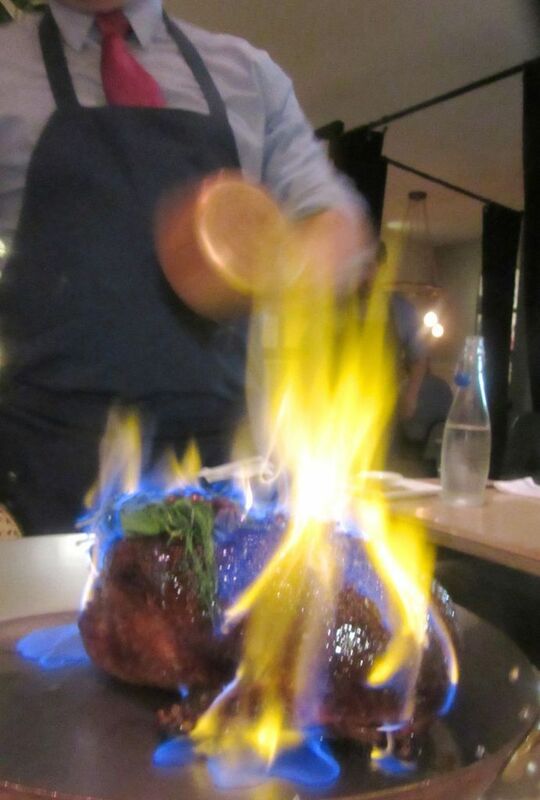 The lacquered duck is presented whole and then flamed with orange-flavored bourbon. 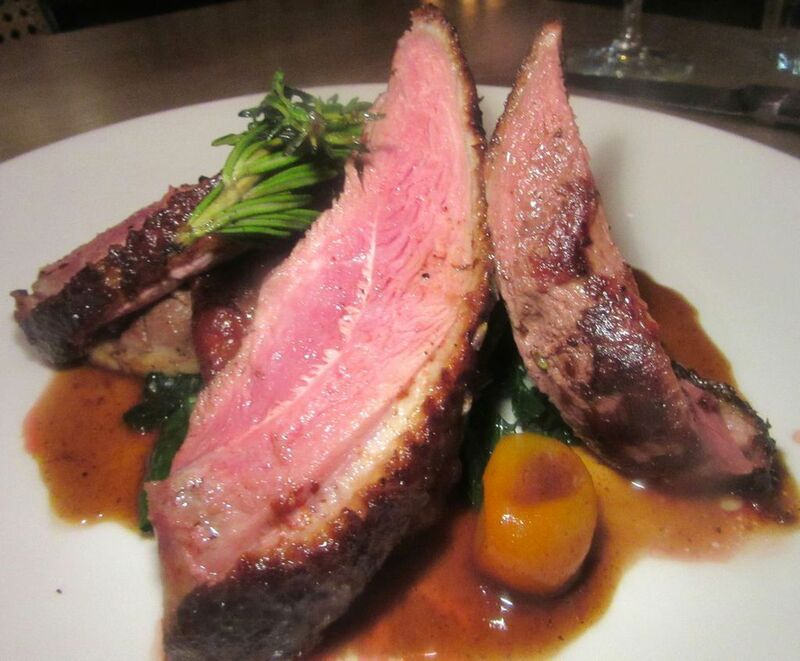 The duck is carved into thick slices and served with kale and kumquats. Enough for three or four. The fat bird arrives whole. 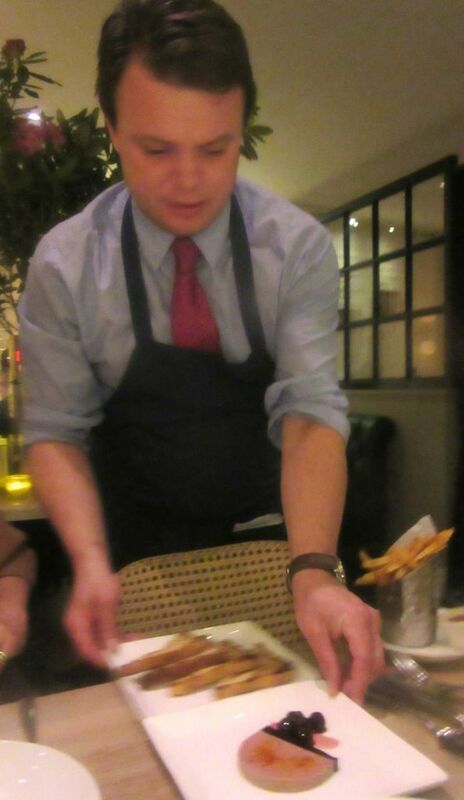 The waiter ignites a cup of orange-tinged bourbon orange for the flambé. When the flames die, he snatches it away and brings the duck back sliced on three plates. Thick, meaty slices with a hedge of sautéed kale and a scattering of sweet candied kumquats. We agree it could easily serve four. 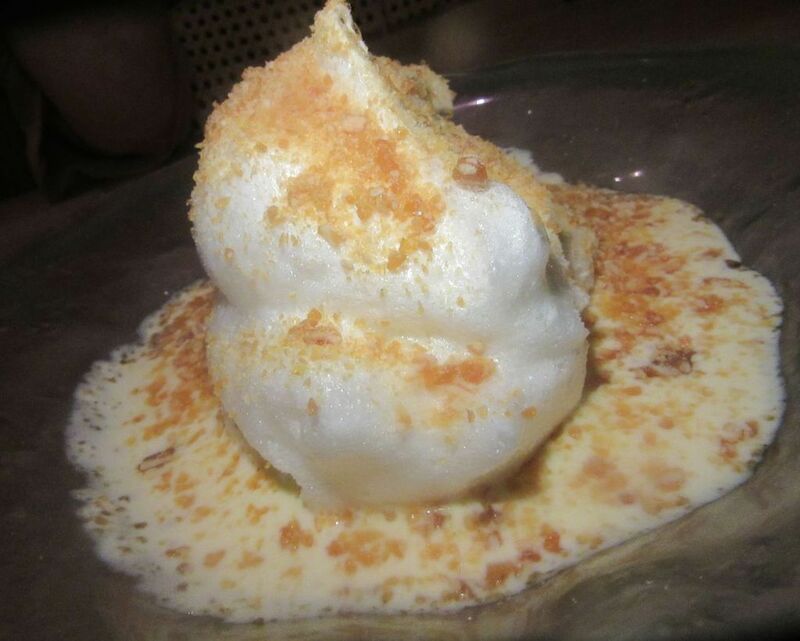 Among the classic French desserts is this floating island with a meringue peak in a delicious sauced. As often happens on these tasting dinners, my friends and I are too full for dessert, but when Latapie insists, sending a large plate of floating island, none of us can resist the rich crème anglaise, certainly not me. Since I first noticed him at Le Cirque, François Latapie and I have often cross paths but not in recent years. I remember Latapie when he was maître ‘d at Le Cirque. He’d moved on with the team that opened La Goulue. 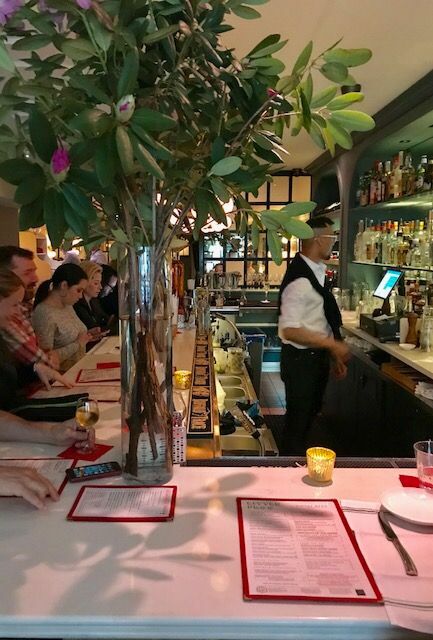 He popped up again in 2010 as a bon vivant host in the cozy little Lyon, formally Lyon Bouchon Moderne, in the West Village. The ceiling curved, giving it a cozy railway dining car feel. “I thought I would make it look like a train,” Latapie explained, “like the train you take from Paris to Lyon.” There weren’t many seats and the locals had already discovered it. I lost track of the place and it disappeared. 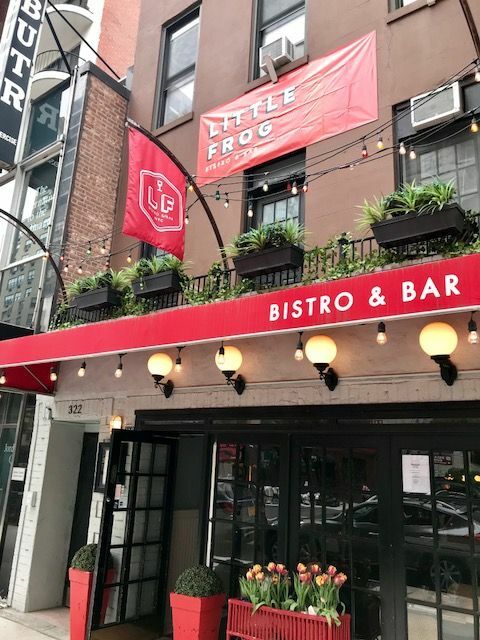 At some point last year Little Frog had become a fixture on east 86th Street, though none of my East Side chums ever mentioned it to me until last week. I needed another dinner to explore the house’s obsession with meat. 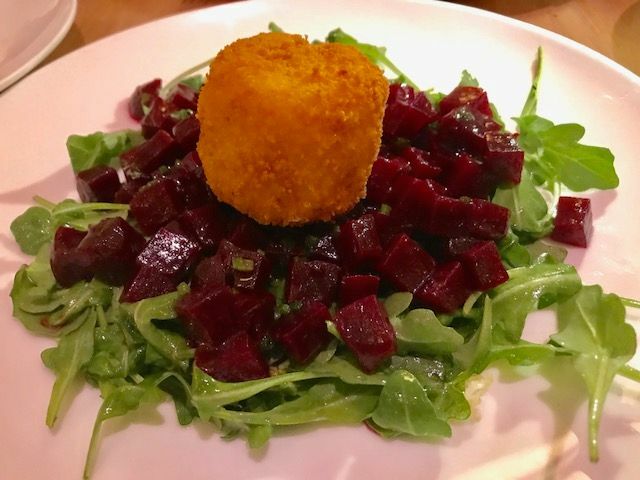 A round of breaded goat cheese is surrounded by luscious little beet cubes. 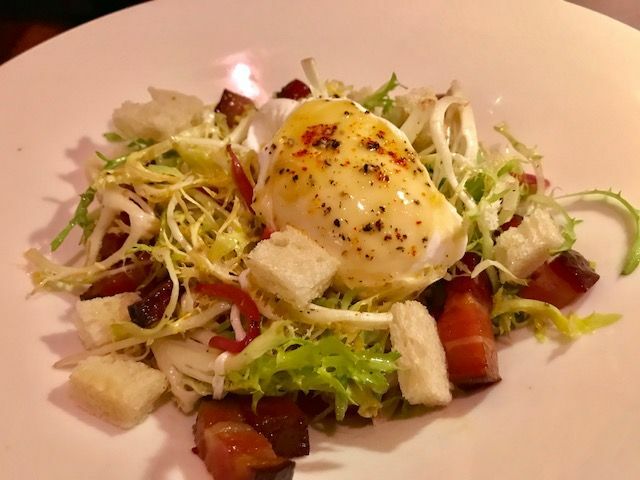 A duo of softly poached eggs and meaty bacon lardons make this frisée salad especially pleasing. Again we are three and, again, the warm fougasse arrives as a good omen. But that’s not quite enough to make up for a lame margarita delivered without its splash of Grand Marnier. My niece’s husband is grumpy. “The bartender has a great hairdo,” I point out. Clearly, the eccentric coif doesn’t offset the wimpy drink. 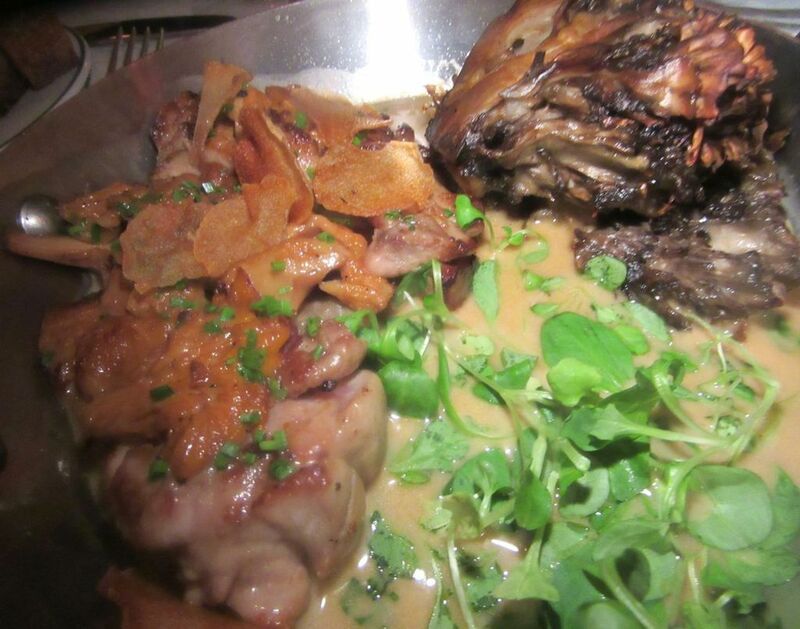 The soft-shell crab special on romensco sauce is piled with celery remoulade and apples, an overload. 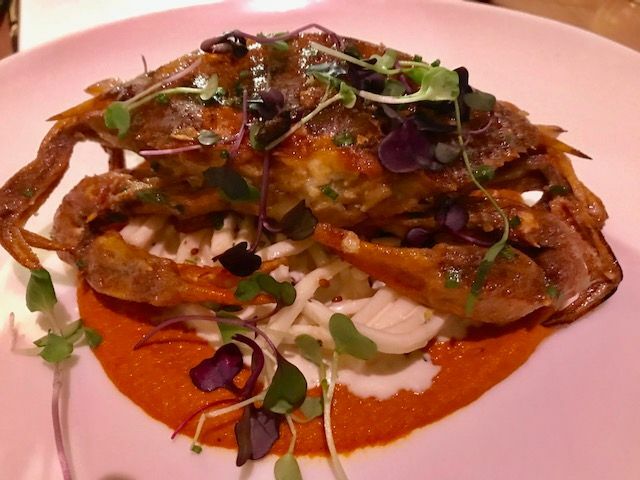 The special sautéed soft-shell crab on romesco sauce with celery remoulade and apple has me worrying that chef Xavier Monge is into overkill. The crab gets lost in the excess. The very thick pork T-bone is tender enough on one side, but overcooked and too chewy on the other. 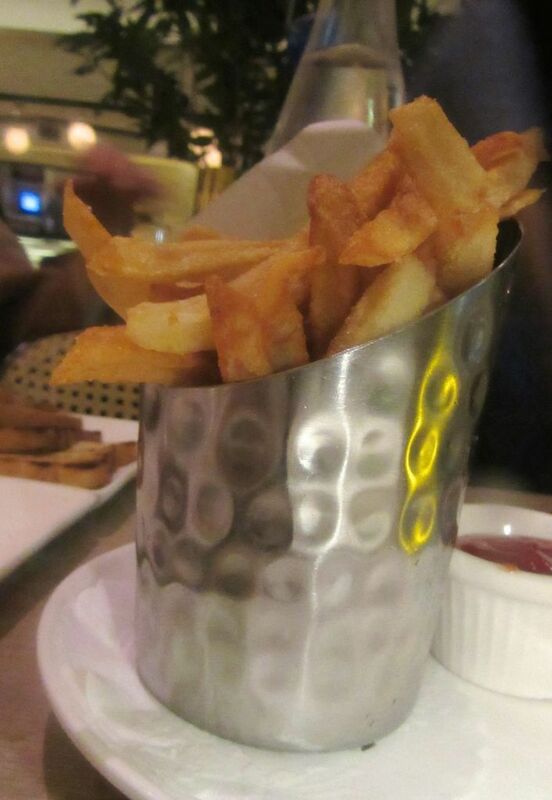 The hand-cut house made fries are good enough. No need to dip them in ketchup, mayo or sauce choron. Not that I mind finding two poached eggs with chewy lardons on the frisée salad. It’s the tasteless commercial croutons I prefer to ignore. 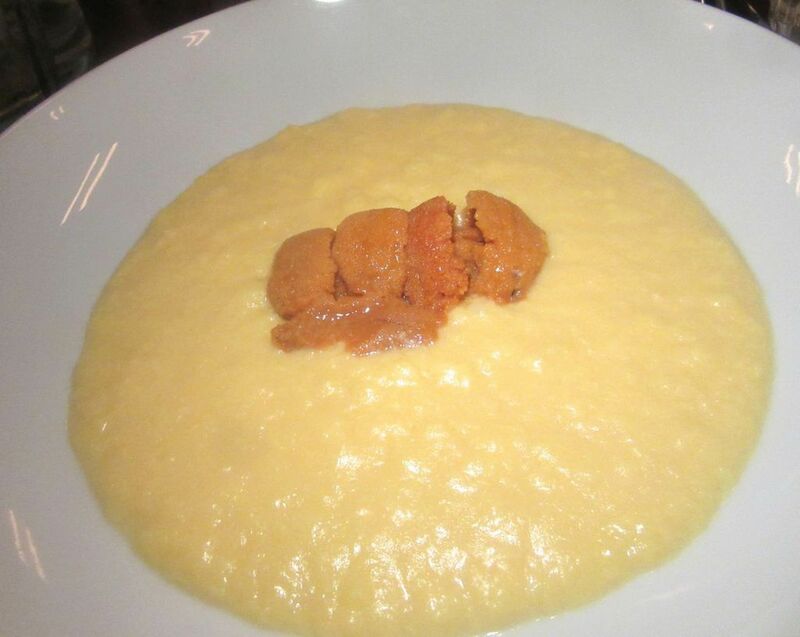 Especially since the bucatini with sun dried tomato, mullet roe and bread crumbs is excellent. As is the ball of battered and roasted chèvre surrounded by small squares of fresh beet -- an odd mating that somehow works. 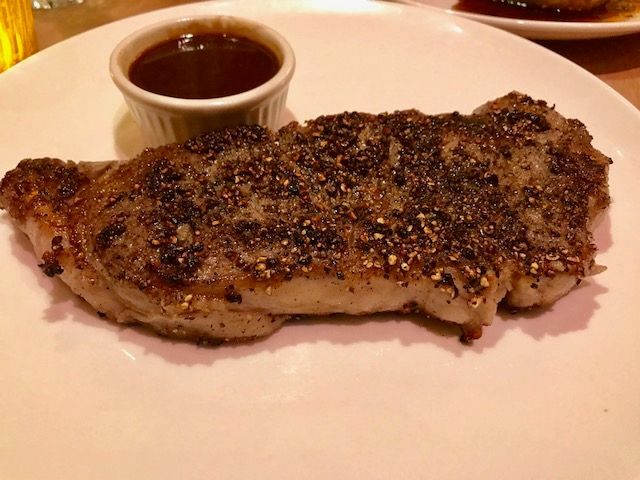 I find the steak au poivre too thin and not rare enough. 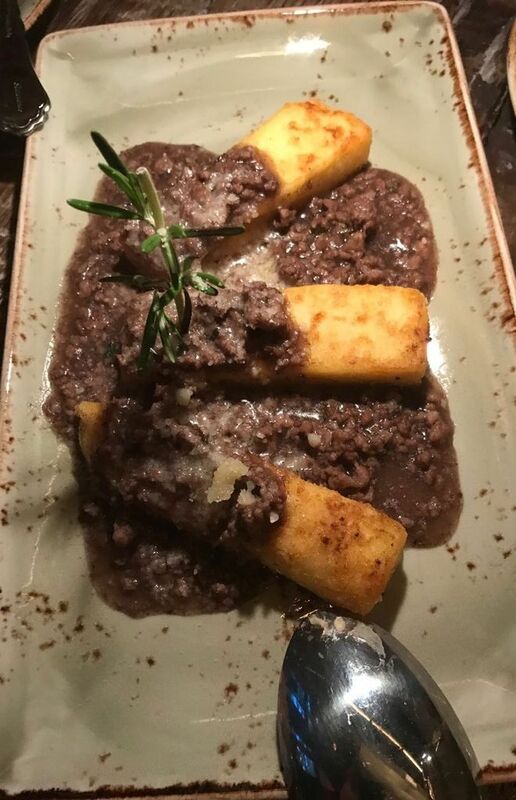 Perhaps asking for the brandy sauce on the side discourages the kitchen. 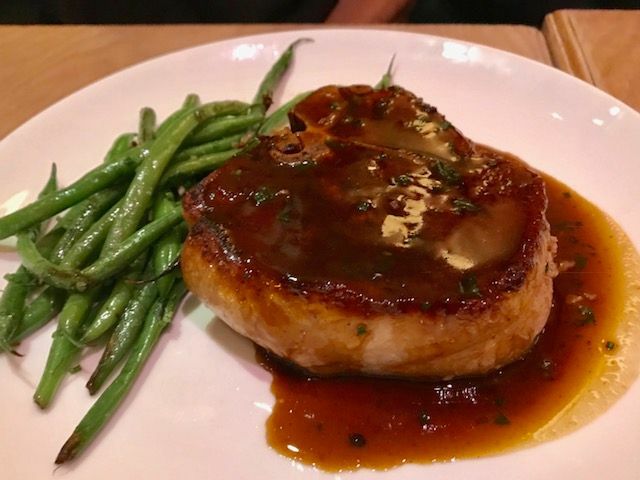 The tenderloin of the pork T-bone is luscious but the strip is tough and over cooked. 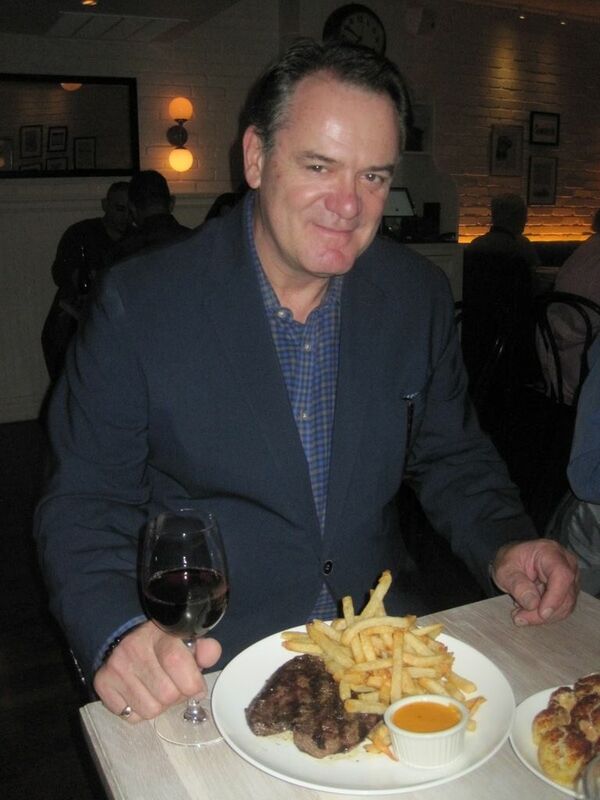 The fries are good, though I wish I’d asked for them extra brown. Come for the fine Frogger Burger with Cabot cheddar, charred red onion and maple bacno, plus fries. It’s definitely the Frogger Burger that might bring you back. 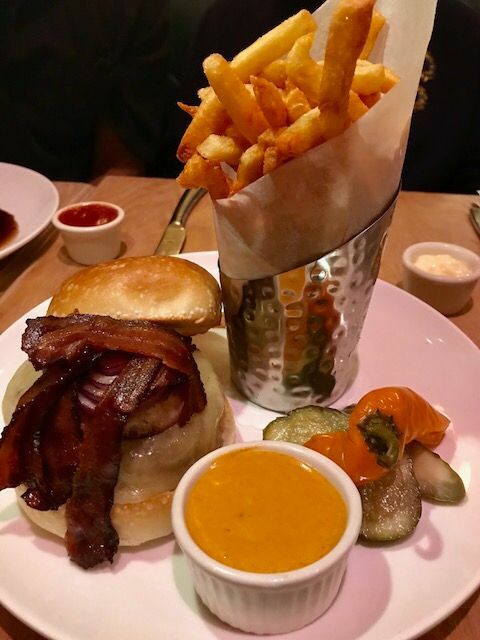 Made from a Pat LaFrieda blend, it’s layered with Cabot cheddar, charred red onion and thick maple bacon, a tumbler of sauce choron alongside. It doesn’t actually need that embellishment. Still, the bun would be better toasted. By 8:30 most evenings, the bar and the room are filled with locals, many of them embracing each other. When our waiter pronounces the dessert special as a “Real French peach Melba,” I forget it’s too soon for fresh peaches. Not that it isn’t winning with its drift of whipped cream and slivered almonds. At that point, I am desperate to leave. The early calm when the room was just a third occupied and no one at the bar has vanished. The house is crowded now with families, clearly regulars, hugging each other, making room at already crowded tables and shouting anthems of exuberance. They are the true owners of Little Frog. 322 East 86th Street between First and Second avenues. 347 537 5786. Sunday and Monday 5:30 pm to 10 pm, Tuesday through Thursday 5:30 pm to 11 pm, Saturday and Sunday 11 am to 3:30 pm, 5 pm to midnight.